For companies looking for entertaining methods for team building and employee appreciation, THEY improv provides a variety of fun approaches for murder mystery dinners in Maryland for a variety of groups and gatherings. 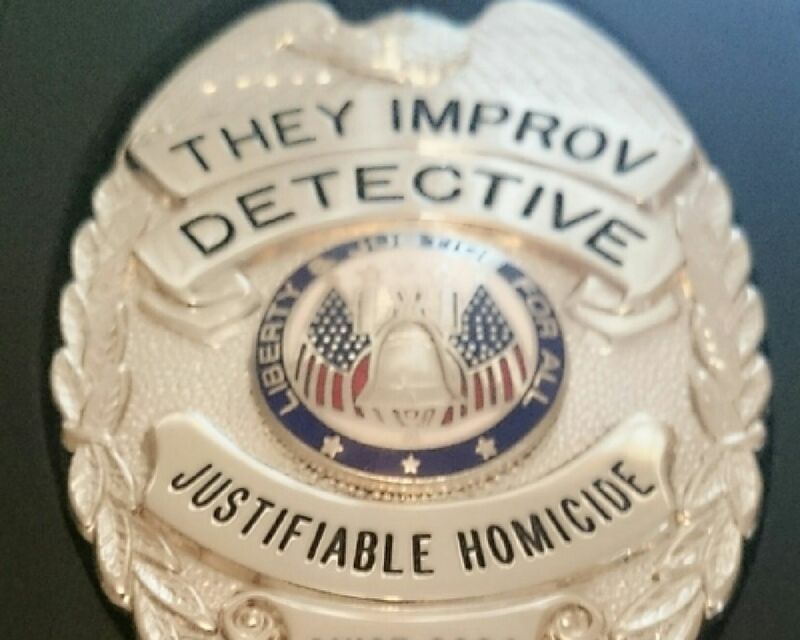 A THEY improv Maryland murder mystery event customized for your group in the Mid-Atlantic has proven to be Perfect for teambuilding corporate events, meetings and incentives awards, weddings, family gatherings, dinners or charity fundraising! So exactly what is a Maryland murder mystery dinner or lunch and what does it entail? To answer this, and more specific questions, we have assembled a list of frequently asked questions here, along with appropriate answers. Q: Do you perform public shows? A: Most of our shows are private parties and corporate events. We do not have a regular venue where you can participate in public shows. The rare opportunities we do have for public shows are highly sought after and often sell out. If you would like to hear about these rare opportunities when the occur, simply sign up for our mailing list and mention a desire for our mystery shows. If you are a restaurant or hotel owner that would like to discuss having a quality show in your venue, contact us. We are capable of generating a lot of interest in your venue and are reasonably priced. Q: You say that you customize shows, how customized are they? A: For our full shows or galas, every script is unique and written for the show and group involved. There may be certain elements that have been repeated over the years, but we tailor directly to you. Additionally, all of our performers have years of improvisational training and public performances under their belt. This means that their improv skills are fully taken advantage of and can react to the situations around them. Literally, we could not perform the same show twice even if we tried. For smaller events such as the Cambridge Solutions or Clue Parties, these may be very similar to past shows, but even these are customized some to the group involved. Q: What makes a THEY improv Murder Mystery different from those of other companies? A: THEY improv stands out in the murder mystery business in a lot of ways. The most obvious is that the cast of THEY improv is comprised of some of the top improvisational comedy talent. This means that the show not only has a great interactive experience for the audience, but that the entire cast adjusts to the changing needs and comedic energy of the group involved. Secondly, THEY improv never forgets that the emphasis is on entertainment, not on mystery. The show is designed to entertain the audience more than perplex them. To that effect, we push the murder back in the plot allowing for a larger amount of audience interaction and fun prior to the murder and a shorter interrogation time. In some shows the detective is the star. In ours, the comedy is. Thirdly, some performance groups try to beat the audience as a way to prove their superiority and to save money by not even give out any prizes. THEY improv guarantees that someone will have been correct in their solution even if we have to change the correct answer for our full shows. There are a lot of ways we're different. The best way for you to find out how is to contact us for a show and see for yourself. Q: Is your material appropriate for younger or sensitive audience members? A: Younger or more sensitive audience members should have no problem enjoying a night of fun and clean comedy when THEY improv takes the stage. We are predisposed to performing clean comedy shows. If, however, we are requested to become more lively in our performance, we may do so. After all, our murder mysteries are custom-tailored for the audience involved. If you have more than just a couple of children but are instead throwing a gathering for a group of kids, we have specific themes written for children. To ensure a great evening simply inform us at the time of contracting for the show. Q: I have a small group, can I have you perform for us? A: Smaller groups can get cost-prohibitive for murder mysteries, but THEY improv may still be able to help. Although our more standard murder mysteries have custom-tailored scripts and 4-8 actors, we do have other options to bring the cost down. This can be even more important for non-profit organizations looking to have a fundraiser. There are two additional approaches we can take. First, is our Cambridge Solution. This is called the Cambridge Solution because we considered it to be Harvard smart when we developed it. It uses 4-10 of your group as characters in the murder. More information is on our Cambridge Murder Mystery Page. For even smaller groups we have our Dartmouth Plan. It's really the Cambridge Solution redesigned to either use everyone as a character in more of a Speed Dating setup or using half of the people as characters. Our second option is what we refer to as Murder Mystery Mayhem or a Clue Party. This is where everyone is a character and they mix and mingle randomly. It comes down to Means, Motive and Opportunity, much like a game of Clue. More information is available on our Murder Mystery Game Show page. Q: What is interactive as opposed to immersive? A: Generally, when someone refers to a show being interactive, it means that the performers will talk to the audience, either to get input or a reaction. Because interactive is a term used and understood in the industry, we tend to use the term incorrectly. Our shows are more accurately referred to as immersive. An immersive performance is where our actors fully participate in the audience experience and can be mistaken as audience members. Some audience members can also be confused with performers. This immersive experience enhances the entire event and increases the involvement of the audience members to the point of maintaining full attention. Q: Are your murder mysteries like a play? A: While we prefer the immersive experience, we can perform "Presentational Murder Mysteries." This is performed on a stage or raised area with sound system like a play and with limited audience interaction. This is usually done for much larger groups and is more heavily scripted. This tends to have a higher cost because of the writing involved. Q: Can my people play some of the parts? A: We have a variety of offerings. Some of our offerings are designed as a mix and mingle party that allows your participants to interview each other to try to determine the culprit. Another offering allows some of your people to play the roles being interrogated by our detective and the audience to determine the culprit. But for our signature immersive murder mystery dinners, you want to limit the exposure of your people as performers. Quite frankly, they're simply not professional, and our people are. But we will customize any event to you and follow your lead as to who you want to participate. So the short answer? Yes, but it isn't our recommendation. Q: What is an ambush murder mystery? A: We are one of the few companies in the country that specializes in the ambush murder mystery. This is a scenario where the audience is unaware that a murder mystery is occurring. We create a situation where our players would reasonably be expected to be in the location. After establishing the legitimacy of our characters, we then create situations that would rarely happen at parties. The 'train wreck moments' are designed to get the audience talking about what's going on around them and attempt to intercede on behalf of our characters. Think of it as an elaborate prank being played on your audience. When the death finally occurs, the audience then realizes that they've been had and are led through the process of determining the culprit. One of the major advantages of this form of show is that the audiences expectations are constantly changed. Q: What kind of venues are you available to perform in? A: THEY improv is capable of performing anywhere. After all, we are improvisational. We are used to making do and reacting to what is at hand. Generally we perform in banquet spaces, dining rooms, hotels, restaurants, conference centers and theaters. The question usually comes down to an ability to be seen and heard by the audience. The real answer is that you should contact us if you have a venue that you have a question about and we are certain that we can find a way to make it work. Q: You don't seem to be located near me, can you still perform for us? 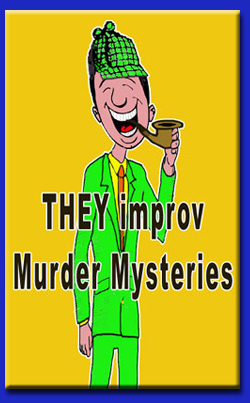 A: THEY improv is one of the fastest growing murder mystery companies in the country. 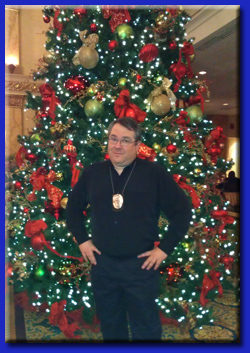 Right now we provide murder mystery shows in Baltimore, Silver Spring, Bethesda, Chesapeake Bay, Columbia and Annapolis as well as the surrounding areas. Other locations are available around the country and there are new locations being added and coming soon, so you should simply ask and we might already be there. Additionally, we can serve other areas with a slight charge for travel that may have us still your least expensive option. And if we are not the least expensive? Isn't having the best worth it? Q: What are your prices for a show? A: Because every corporate event and private party is custom designed you have to contact THEY improv directly to receive a quote for your banquet. Prices range based on the costs for a show, but are generally the choice of our clients. The more actors, the more props, the more costumes, the larger the event, the more the writing, the higher the cost. If it costs us more, it costs the clients more. These parties can vary wildly with very small parties (with one facilitator) starting at $800, though normally closer to $1,250, and climb up to $2,000 or more. Providing any kind of an accurate range of pricing for larger events is impossible. We have some for small groups with 4 of our actors around the $2,500 range going up to Galas with 10-15 actors, dancers, an ambulance crew and other props that can climb to the $15,000-25,000 range. Shows in more isolated areas or in busy times such as the holidays may be for slightly more than our more standard pricing. Don't worry about any of this, simply contact us and we'll explain how this works. Unfortunately there are just too many options to predict for a website. The reality is that we will either provide a viable option for your gathering or let you know some other options or that the budget just isn't there. Contact us for a detailed quote. Q: Will these shows work at a luncheon? A: Even though we call them dinners, the reality is that a lot of our events take place during the day. Lunch is quite common and it operates basically the same, though often there is no cocktail hour. It can be a great idea to entertain your employees without keeping them after hours. Likewise, an ambush at lunch works well with our people to look like a regular team building group or lecturer. Contact us to find ideas that might work for your group based on your timing. Q: Are there gunshots at your shows? A: Generally no, but we work based on our direction from our clients. Based on the desires of the client, we may have gunshots (blanks, of course), stabbings, etc. All such things are usually done to comedic effect and may require authorization of the venue and appropriate security staffs. Likewise, the Client must indemnify us and indicate to potential guests with any conditions the inherent issues or concerns. 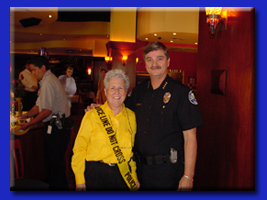 If you are the one hiring us for a private party or corporate event, then whether there are gunshots is up to you. But as mentioned, we'd recommend not to have them. A: We can accept most forms of payment including checks, credit cards, ACH, cash, PayPal and just about anything else that you can come up with. Usually we require 50% up front with a follow-up of the final 50% one-week prior to the event. 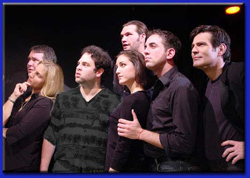 THEY improv is proud to work throughout the state including Annapolis, Silver Spring, Bethesda, Gaithersburg, Frederick, Rockville, the Eastern Shore of the Chesapeake Bay, Columbia, Linthicum, Laurel, Bowie, College Park, Towson, Woodlawn, Catonsville, Owings Mills, Salisbury, Ocean City, Hagerstown and Baltimore.